One of the most common and challenging tasks for any application involves persisting and reading information to and from a database. 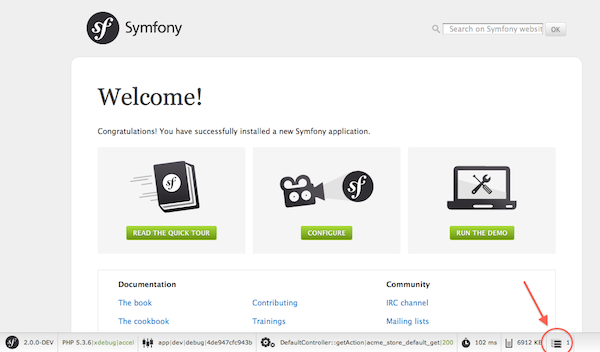 Although the Symfony full-stack Framework doesn't integrate any ORM by default, the Symfony Standard Edition, which is the most widely used distribution, comes integrated with Doctrine, a library whose sole goal is to give you powerful tools to make this easy. In this chapter, you'll learn the basic philosophy behind Doctrine and see how easy working with a database can be. Doctrine is totally decoupled from Symfony and using it is optional. This chapter is all about the Doctrine ORM, which aims to let you map objects to a relational database (such as MySQL, PostgreSQL or Microsoft SQL). If you prefer to use raw database queries, this is easy, and explained in the "How to Use Doctrine DBAL" cookbook entry. Be careful that your class name and properties aren't mapped to a protected SQL keyword (such as group or user). For example, if your entity class name is Group, then, by default, your table name will be group, which will cause an SQL error in some engines. See Doctrine's Reserved SQL keywords documentation on how to properly escape these names. Alternatively, if you're free to choose your database schema, simply map to a different table name or column name. See Doctrine's Persistent classes and Property Mapping documentation. Keep in mind that Doctrine's entity generator produces simple getters/setters. You should check generated entities and adjust getter/setter logic to your own needs. Note that you don't need to use this command. Doctrine doesn't rely on code generation. Like with normal PHP classes, you just need to make sure that your protected/private properties have getter and setter methods. Since this is a common thing to do when using Doctrine, this command was created. Doctrine doesn't care whether your properties are protected or private, or whether you have a getter or setter function for a property. The getters and setters are generated here only because you'll need them to interact with your PHP object. Actually, this command is incredibly powerful. It compares what your database should look like (based on the mapping information of your entities) with how it actually looks, and generates the SQL statements needed to update the database to where it should be. In other words, if you add a new property with mapping metadata to Product and run this task again, it will generate the "alter table" statement needed to add that new column to the existing product table. An even better way to take advantage of this functionality is via migrations, which allow you to generate these SQL statements and store them in migration classes that can be run systematically on your production server in order to track and migrate your database schema safely and reliably. lines 10-13 In this section, you instantiate and work with the $product object like any other, normal PHP object. line 15 This line fetches Doctrine's entity manager object, which is responsible for handling the process of persisting and fetching objects to and from the database. line 16 The persist() method tells Doctrine to "manage" the $product object. This does not actually cause a query to be made to the database (yet). line 17 When the flush() method is called, Doctrine looks through all of the objects that it's managing to see if they need to be persisted to the database. In this example, the $product object has not been persisted yet, so the entity manager executes an INSERT query and a row is created in the product table. When creating or updating objects, the workflow is always the same. In the next section, you'll see how Doctrine is smart enough to automatically issue an UPDATE query if the record already exists in the database. When querying in Doctrine, you have two options: writing pure Doctrine queries or using Doctrine's Query Builder. If you're comfortable with SQL, then DQL should feel very natural. The biggest difference is that you need to think in terms of "objects" instead of rows in a database. For this reason, you select from the AppBundle:Product object (an optional shortcut for AppBundle\Entity\Product) and then alias it as p.
In the previous sections, you began constructing and using more complex queries from inside a controller. In order to isolate, test and reuse these queries, it's a good practice to create a custom repository class for your entity and add methods with your query logic there. Next, add a new method - findAllOrderedByName() - to the newly generated repository class. This method will query for all the Product entities, ordered alphabetically. The entity manager can be accessed via $this->getEntityManager() from inside the repository. When using a custom repository class, you still have access to the default finder methods such as find() and findAll(). Suppose that the products in your application all belong to exactly one "category". In this case, you'll need a Category object and a way to relate a Product object to a Category object. Start by creating the Category entity. Since you know that you'll eventually need to persist the class through Doctrine, you can let Doctrine create the class for you. This task generates the Category entity for you, with an id field, a name field and the associated getter and setter functions. First, since a Category object will relate to many Product objects, a products array property is added to hold those Product objects. Again, this isn't done because Doctrine needs it, but instead because it makes sense in the application for each Category to hold an array of Product objects. The code in the __construct() method is important because Doctrine requires the $products property to be an ArrayCollection object. This object looks and acts almost exactly like an array, but has some added flexibility. If this makes you uncomfortable, don't worry. Just imagine that it's an array and you'll be in good shape. The targetEntity value in the decorator used above can reference any entity with a valid namespace, not just entities defined in the same namespace. To relate to an entity defined in a different class or bundle, enter a full namespace as the targetEntity. Ignore the Doctrine metadata for a moment. You now have two classes - Category and Product with a natural one-to-many relationship. The Category class holds an array of Product objects and the Product object can hold one Category object. In other words - you've built your classes in a way that makes sense for your needs. The fact that the data needs to be persisted to a database is always secondary. Now, look at the metadata above the $category property on the Product class. The information here tells Doctrine that the related class is Category and that it should store the id of the category record on a category_id field that lives on the product table. In other words, the related Category object will be stored on the $category property, but behind the scenes, Doctrine will persist this relationship by storing the category's id value on a category_id column of the product table. 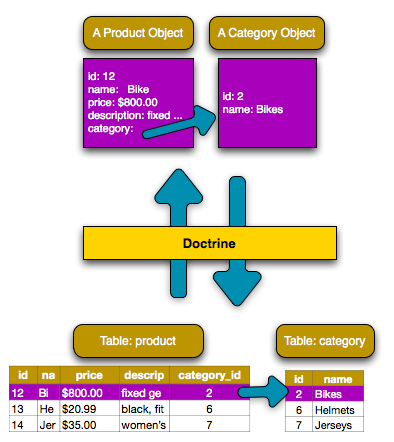 The metadata above the $products property of the Category object is less important, and simply tells Doctrine to look at the Product.category property to figure out how the relationship is mapped. This task should only be really used during development. For a more robust method of systematically updating your production database, read about migrations. Now, a single row is added to both the category and product tables. The product.category_id column for the new product is set to whatever the id is of the new category. Doctrine manages the persistence of this relationship for you. In this example, you first query for a Product object based on the product's id. 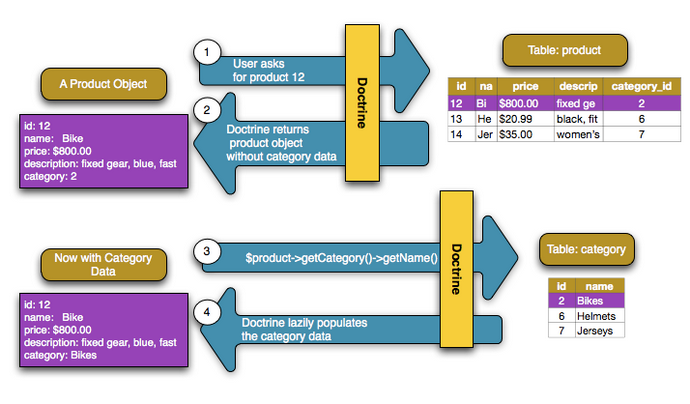 This issues a query for just the product data and hydrates the $product object with that data. Later, when you call $product->getCategory()->getName(), Doctrine silently makes a second query to find the Category that's related to this Product. It prepares the $category object and returns it to you. What's important is the fact that you have easy access to the product's related category, but the category data isn't actually retrieved until you ask for the category (i.e. it's "lazily loaded"). In this case, the same things occurs: you first query out for a single Category object, and then Doctrine makes a second query to retrieve the related Product objects, but only once/if you ask for them (i.e. when you call ->getProducts()). The $products variable is an array of all Product objects that relate to the given Category object via their category_id value. This proxy object extends the true Category object, and looks and acts exactly like it. The difference is that, by using a proxy object, Doctrine can delay querying for the real Category data until you actually need that data (e.g. until you call $category->getName()). The proxy classes are generated by Doctrine and stored in the cache directory. And though you'll probably never even notice that your $category object is actually a proxy object, it's important to keep it in mind. In the next section, when you retrieve the product and category data all at once (via a join), Doctrine will return the true Category object, since nothing needs to be lazily loaded. In the above examples, two queries were made - one for the original object (e.g. a Category) and one for the related object(s) (e.g. the Product objects). Remember that you can see all of the queries made during a request via the web debug toolbar. This section has been an introduction to one common type of entity relationship, the one-to-many relationship. For more advanced details and examples of how to use other types of relations (e.g. one-to-one, many-to-many), see Doctrine's Association Mapping Documentation. If you're using annotations, you'll need to prepend all annotations with ORM\ (e.g. ORM\OneToMany), which is not reflected in Doctrine's documentation. You'll also need to include the use Doctrine\ORM\Mapping as ORM; statement, which imports the ORM annotations prefix. Sometimes, you need to perform an action right before or after an entity is inserted, updated, or deleted. These types of actions are known as "lifecycle" callbacks, as they're callback methods that you need to execute during different stages of the lifecycle of an entity (e.g. the entity is inserted, updated, deleted, etc). If you're using annotations for your metadata, start by enabling the lifecycle callbacks. This is not necessary if you're using YAML or XML for your mapping. The above example assumes that you've created and mapped a createdAt property (not shown here). Now, right before the entity is first persisted, Doctrine will automatically call this method and the createdAt field will be set to the current date. There are several other lifecycle events that you can hook into. For more information on other lifecycle events and lifecycle callbacks in general, see Doctrine's Lifecycle Events documentation. Notice that the setCreatedAtValue() method receives no arguments. This is always the case for lifecycle callbacks and is intentional: lifecycle callbacks should be simple methods that are concerned with internally transforming data in the entity (e.g. setting a created/updated field, generating a slug value). If you need to do some heavier lifting - like performing logging or sending an email - you should register an external class as an event listener or subscriber and give it access to whatever resources you need. For more information, see How to Register Event Listeners and Subscribers. And even though Doctrine revolves around a simple concept, it's incredibly powerful, allowing you to create complex queries and subscribe to events that allow you to take different actions as objects go through their persistence lifecycle.